Featured » The Herons Are Happening! 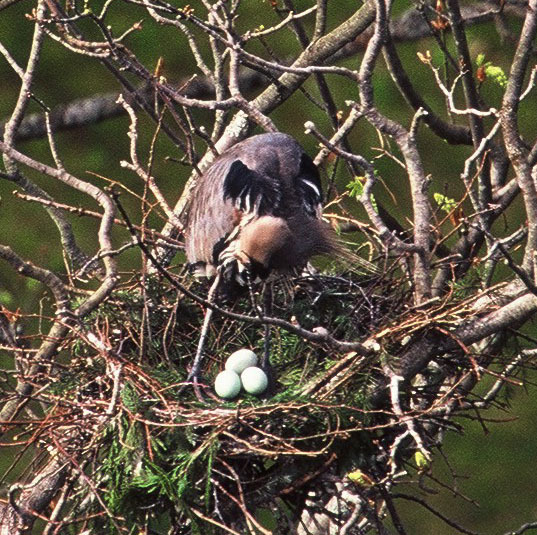 Last year, in collaboration with the Vancouver Park Board, SPES launched a web camera that offered people a bird’s eye view of the Pacific Great Blue Heron colony in Stanley Park. Viewers were treated to displays of mating, hatching, feeding, and learning to fly. This year, we are pleased to announce an upgraded camera and website to bring viewers even closer to all the action. You can immerse yourself in the colony at: vancouver.ca/heroncam. Pacific Great Blue Herons are a distinct subspecies that are considered “at risk” in BC due to their declining population. The thriving Stanley Park colony is unique due to its proximity to the city and its tolerance of the accompanying human activity. We are excited that, year after year, these magnificent birds return to the trees near the Vancouver Park Board administrative offices. The heron camera is great way to help people connect with these magnificent birds from anywhere in the city, or on the planet! To learn more about these birds, check out our heron info page. Stanley Park Ecology Society helps to monitor and sustain this population. We added protective metal wrapping around the trees to reduce egg predation from raccoons, and we closed off and naturalized areas to reduce disturbances. From the roof of an adjacent building, our monitors record data on the colony including nest success rate and colony size. You can help support all of these efforts by adopting a nest!